Toddlerhood is a time for exploration. This is the age when your baby graduates from being immobile to discovering the freedom that comes with movement. If you haven’t discovered this already, your previously ‘safe’ spots are no longer safe. When you are not looking, your toddler will be trying to break into your cupboards, pull books off shelves and toss things off tables. One of the best ways to minimize the destruction of things around your house or at least, to help you retain some sanity is to find a safe alternative to engage your toddler’s attention. A playhouse is one such example. Playhouses are great because they normally come with a lot of features and activities that will hopefully keep your toddler distracted for quite a while. You can also put a playhouse in a child-proof room or in your backyard if there is nothing dangerous for your child to get into. If you invite parent friends over for a playdate, a playhouse is normally a great way for your toddlers to get to know one another and play together. We think playhouses should have as many activities as possible and be structurally sound. Depending on how big the space you have available for the playhouse, the size of the playhouse might be an issue worth considering seriously. These are our 7 favorite playhouses for toddlers. This Playhouse is big and roomy enough for your toddler to play in it with many friends. 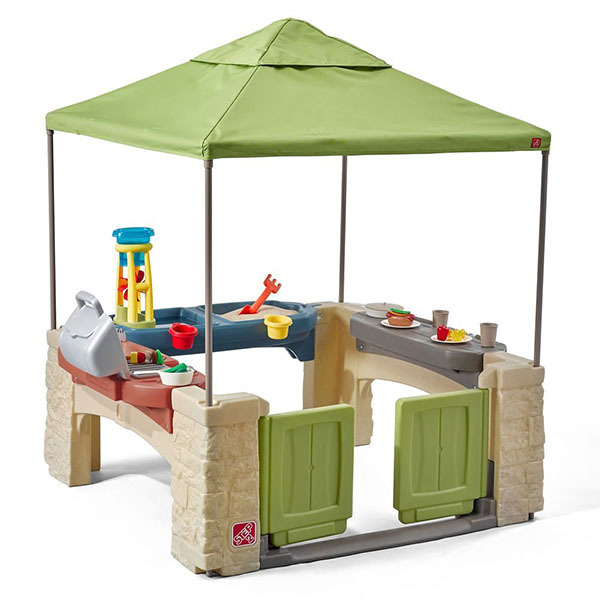 There is a kid’s kitchen with a grill, sink and a swivel faucet, a sand and water play area with a water tower and water wheel, and also a snack table. Let your toddler pretend to be a master chef or master-BBQer! Due to its size, this playhouse is probably more suited to be placed outdoors unless you have a really, really big room indoors! Just watch out for a bit of potential mess with the sand and water play too. We love this Kiddey Knight’s Playhouse because it looks so cool! 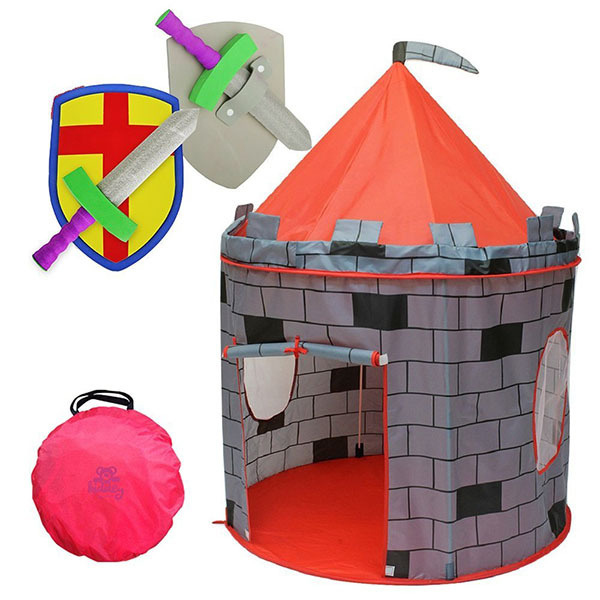 Made to look like a castle tower, your kids will have tons of fun imagining themselves as knights and princesses. It is secured to the ground by ground stakes and has flaps that can open and close. There is also a mesh fabric over the window to keep bugs out if you decide to use this outdoors. Best of all, it comes with a free “sword and shield knight set”! Time to head to Camelot my friends! 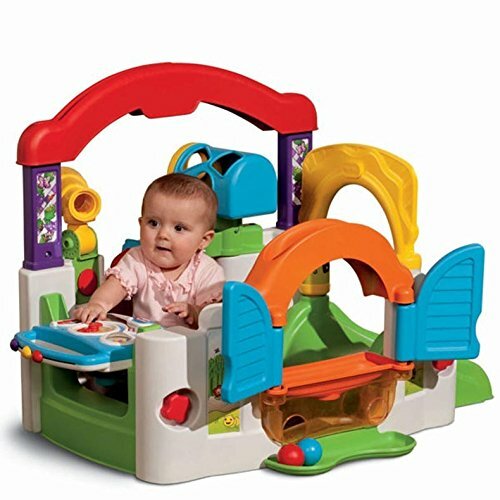 The Step2 Playhouse is fun, controlled chaos. 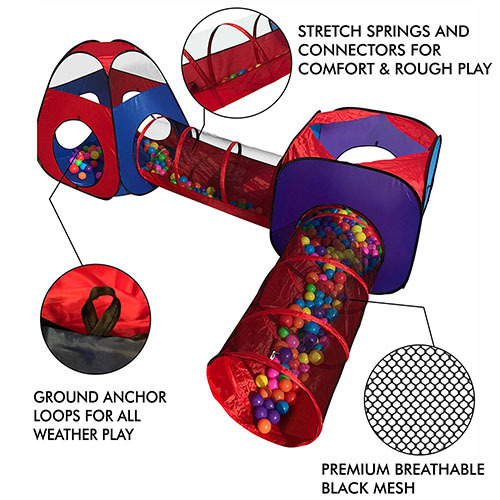 It is engaging because it comes with 20 balls and is designed to allow your toddlers to throw them up to the roof of the house and watch the balls roll down. We all know that toddlers love throwing things so this playhouse will keep toddlers engaged for a while. 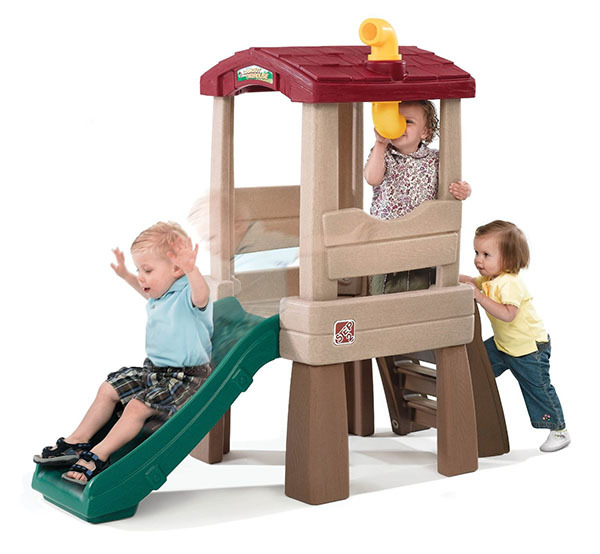 Depending on the space they are playing in, it could also create a lot of chaos so only get this playhouse if you have a dedicated space where you don’t mind toddlers running around crazily trying to catch fallen balls. The playhouse comes with cute Dutch doors and comes with a pitcher and pot in case your toddler wants to play in the house quietly. The colors of this playhouse are bright and cheery and is great for visual stimulation. The balls will help with hand-eye coordination as well as provide sensory stimulation. This Activity Garden Treehouse is filled with activities- over 80, in fact. It comes with multicolored, dancing disco lights and accompanying the music. There is also a shape sorting tree with 3 blocks, a mailbox, a doorbell, open and shut doors, a mini slide, a clock, a giraffe zig-zag ball drop, 2 ladybug clickers, a ball spinner and a toucan ball feeder, among other things. 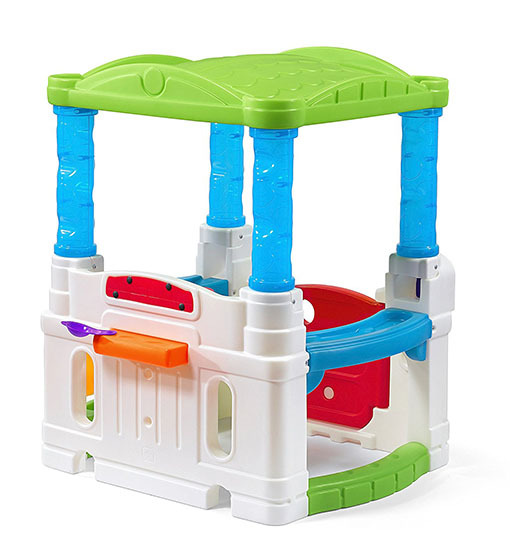 Colorful and versatile, this playhouse will keep your toddler engaged for a long time. The Step2 Lookout Treehouse is not just an ordinary playhouse; it is more of a treehouse with a built-in slide! The playhouse comes with a working kid’s periscope. You can use this indoors or outdoors. The roof provides some shade for your toddler but the big attraction is obviously the slide. If you are looking for something to be used outdoors, this is a great choice. 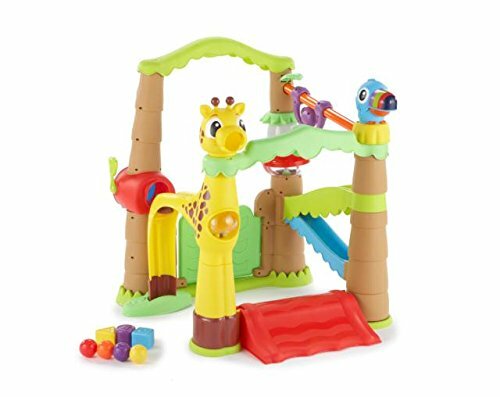 The Little Tikes Activity Garden is similar to the Treehouse version mentioned above but this one is shaped more like an actual home. It is painted in bright, cheery colors as usual but this playhouse also comes with windows, a removable play panel, telescope, 3 letter blocks, 4 balls, a mirror, a flowerpot, ball shaker and a trilingual interactive telephone in English, Spanish and French. As you can see, lots and lots for your toddler to explore and interact with. Also great for peekaboo games. The Playz Pop Up Tents is not really a playhouse but it serves the same function. The Playz Pop Up Tents comes with 2 tents and 2 tunnels. You can separate them or connect them together and your toddler (with friends) can spend a lot of time playing make-believe in these. Your toddler could use his or her imagination and create hideouts, caves, and forts easily with these tents and tunnels. If you intend to use everything at once, this is probably more suited for outdoor play due to its size.